Leading food and drink research company Campden BRI has developed a method for Black Moth to boost the flavour extracted from European Périgord truffles - the key ingredient in the brand's truffle vodka. Due to both their elusive nature and delicious flavour, truffles are among the world's most prized culinary delicacies. Black Moth only uses the most expensive winter truffles and wanted to increase the intensity of the flavour of their truffle vodka, so turned to Campden BRI for help. Geoff Taylor, Campden BRI´s wines and spirits expert, drew on his 30 years´ experience of supporting the alcoholic drinks sector through analysis, production and quality assessment, to develop an innovative and highly effective method. 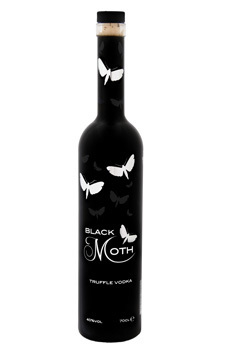 The all-natural characteristic is a key part of Black Moth's brand identity, and so using an artificial truffle flavour, which would have altered the distinctive taste that had made it so popular among vodka aficionados, was absolutely out of the question. Campden BRI's Geoff Taylor, explains: "We assessed various methods to maximise the amount of flavour extracted from the truffles. While the method we chose is top secret, our laboratory and sensory analyses confirmed that it quadruples the truffle flavour." Paul Amin, owner of Black Moth commented: "Campden BRI discovered an ingenious and cost effective solution for us to make the most of an extremely precious raw material. It completely avoids the use of artificial flavourings by maximising the effect of the natural flavours in the truffle. And because of the amount of truffle we have to use – and its price – the solution is extremely cost-effective, providing a significant return on the investment in the research and innovation. It's an absolute win-win. The method not only enhanced the flavour of our flagship product, it has also massively increased the use and efficiency of our most expensive raw material. This wouldn´t have happened without the expertise and technical support of Geoff and his team at Campden BRI." Developing a premium dog food product from concept to production/distribution. Creating a new whisky which met the legal definition of Scotch whisky and Rye whiskey. Maintaining colour stability and integrity during shelf life. Evaluating the use of Pepite HT in the formulation of sausages. A new training course that tackles bakery quality issues. Sensory evaluation on tender samples.